Today, the only remains of the bridge at Allerona are a few stones hidden in the undergrowth...During the summer months the bed of the river is an expanse of white pebbles amongst which, according to the locals, for years small fragments of bone, uniform buttons and parts of weapons have made their way up to the surface...we make our way to the site with a small delegation of local politicians and representatives of the military. Everything is immersed in the blinding light of the summer sun. Harry sets off slowly toward the cement pillars of the modern bridge, and glances back along the country track which from the road winds its way down to the bed of the River Paglia. The local representatives listen to what isn't just a simple wish, a request like so many others. They listen to the 'orders' given out by veteran Shindler. And it is just as if all the white stones on the river bed had spoken. 10:30 - 10:50 Party sets off for Ponte Giulio, Allerona. Lunch for guests – civil dignitaries, students who have worked on the project, British and American guests – at the Castle of Montegiove. A large crowd assembled beneath the arch of the replacement bridge (built by British sappers in August 1944) where the bomb crater in which the victims' bodies were cremated is believed to lie. The monument, concealed beneath a red drape, has been placed above any known flood level. On the left is Harry Shindler and next to him are Heather Pinnell, daughter of Able Seaman Arthur Ross Pinnell of the submarine Saracen and Sue Finley, daughter of Staff/Sergeant Richard A. Morris C Company, 45 Division, 157 Infantry, US Army. Behind them is a commemorative plaque (see later) and next to Harry is the bugler who sounded the Last Post. Sue Finley and Annie McCarthy, the daughters of Staff/Sergeant Richard A. Morris, Heather Pinnell, daughter of Able Seaman Arthur Ross Pinnell and the students from the Art Institute of Orvieto remove the drape from the monument. Retired Generale Franco Stella of the Italian Armed forces, a native of Orvieto, gives the salute as the Last Post is sounded.To the left of the general and the bugler and the four flags representing South Africa, the United Kingdom, Italy and the United States of America, is engineer Fabio Roncella who, after having found some photographs of the disaster on sale on ebay CLICK HERE began the investigations which led to today's commemoration ceremony. To the left, the mayors of those small towns who lie near to the scene of the incident- Orvieto, Allerona, Castelviscardo together with the mayor of Montegabbione. To the right representatives of the British, American and South African embassies. Designed by Alexandra Lebdenko, Franscesca Nicolai and Alina Sevastjanova, students at the Art Insitute of Orvieto, (see above link), the monument was realised by four volunteers - Giampiero Bacchio, Alessandro Santucchi, Diego Santucchi and Sheshi Shyqri. Janet Kinrade Dethick next to the plaque, which she translated (liberally) from the Italian. On 28 January 1944 conscript Alcero Mechelli aged 18 from the village of Parrano was working for the German organisation known as the Todt. Along with others he was taken to the site of the incident, where they was confronted with a mountain of corpses. They were instructed to put them in a bomb crater, drench them in petrol and set light to them. Here Alcero is seen with Heather Pinnell at the Castello di Montegiove, where a buffet had been organised for the participants at the ceremony and where an exhibition of the proposals put forward by the art students had been set up. Giovanni is the husband of Nadia Domenici, whose father Umberto Domenici befriended Corporal Bill Marsh of the 1 South Wales Borderers whilst he was on the run from the Prison Camp at Fara in Sabina. With Giovanni are his two daughters, Daniela and Valentina. The Domenici family had conserved a photograph of Bill's son Gerald and Gerald had kept the letters which Umberto had sent to his father. On the letters was the address of the family home in Percile, and it only took one phone call (made by Janet Kinrade Dethick's husband Enzo Gilini) to put the two families in contact once more. Although the River Paglia was the main cause of flooding in the Orvieto Area on 11/12 November, and despite the fact that the water arrived at the level of the monument, it has not been damaged. Before the flooding took place it had been decided that the 2013 commemoration ceremony would take place on or around 16 June. This morning I made a short visit to the site with my husband and a friend, Hamish Robertson. We laid a small wreath and took some photographs which you can see below. From left to right: a representative of the Granatieri di Sardegna in Umbria, Generale Franco Stella, the Rev. Dana English from All Saints' Anglican Church in Rome, Harry Shindler, Italy Star Association and Fabio Roncella, (holding the clarinet), responsible for the construction and siting of the monument and the ceremonies of 2012 and 2013. Prayers were said for William Anderson, George Thomson and Neville Hollingsworth. A band accompanying a group of singers rendered the 'D Day Dodgers' and Fabio Roncella recounted the story of the finding of Robert Crofts' mess tin. Joan Comrie, daughter of Sergent William Anderson RASC, Ray Roberts, son of Petty Officer Len Roberts of HMS/s Saracen, Heather Pinnell, daughter of Able Seaman Arthur Pinnell of HMS/s Saracen and Alison Murray, granddaughter of Sergeant William Anderson RASC pictured after the ceremony. Note part of the original rail to the right of the photograph. On Sunday 16 June, following the ceremony at the bridge, Councillor David Trovarelli took the above family members on a tour of the camp. After the war the locals moved in and occupied the barrracks. In the background a modified hut can be picked out. the grey building to the left was the camp commander's headquarters. Janet Kinrade Dethick and Orvieto Resident Brian Cumberlidge lay the wreath. Due to the efforts of a person who wishes to remain anonymous the site has now been cleared, the bent rails have been fixed to the bridge and another explanatory plaque, in Italian and English, has been put in place. There was no service today but two well-wishers had been and added a bunch of flowers and a rose (not on the photo as it had died) to last year's wreath which is holding up well. The grass had been cut at the request of another well-wisher who wants to remain anonymous..
A beautiful wreath made of laurel and carnations was laid this year by Janet Kinrade Dethick and Enzo Gilini. 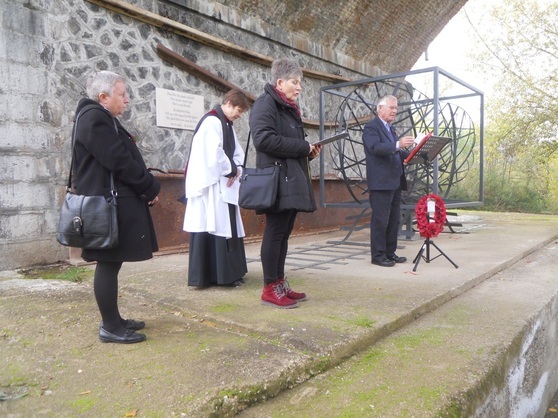 2018 No wreaths were laid on Remembrance Sunday as on the 28 January, for the 75th Anniversary, there will be a special Commemoration ceremony.